So, first things first. I got this fiber at The Florida Fiber In last September. 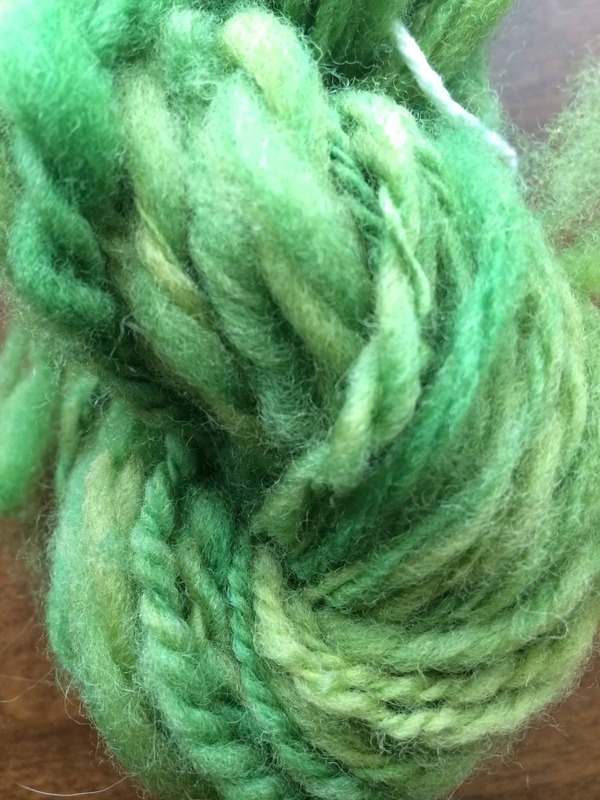 It was part of a learn to spin kit I bought from Ewephoric Fibers. 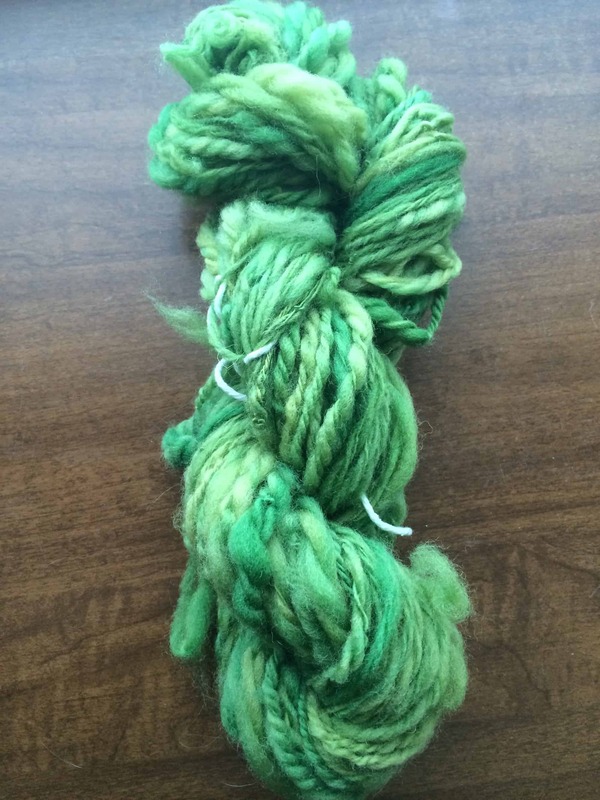 The kit included a spindle and a 2 ounce braid of superwash merino, hand-dyed by Ewephoric Fibers. The spindle is beautiful, hand-painted with gold designs that look a lot like henna. Jane from Ewephoric Fibers sat with me for 1/2 hour after I bought the kit, patiently and expertly showing me how to spindle. I quickly gave it up. 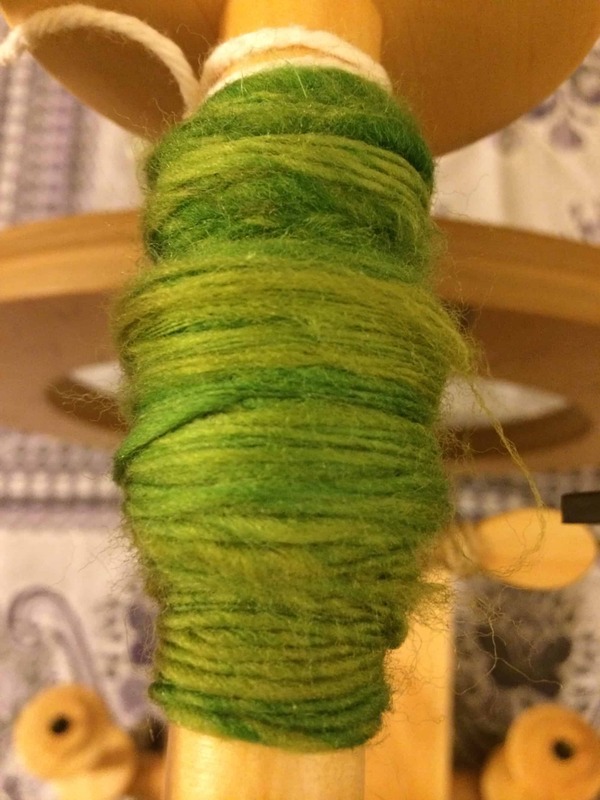 I hate having to stop all the time to wind the spun yarn onto the spindle. I’m also horrible at drafting and felt uncoordinated as I tried to do all the steps required to spindle. The spindle and this fiber have been hanging out on my shelf of yarn, waiting for some love, since the week after I bought the kit. I had all the standard first-spinning problems. Parts of it are underspun. Parts of it are overspun. It’s too thick. It’s too thin. The thread broke on me all the time and my joins are poor. Whatever happened, I just kept spinning. I learned a lot about adjusting the tension on my wheel. I still don’t have that down properly. It seems as though the tension has to be very tight, and the spring pulled out a bit, before the wheel will take up yarn. I’m not happy with that. But I just kept spinning. Who cares if it isn’t perfect? It is first yarn! I did not keep track of how long it took me to spin through the entire braid, but I think it was around 3 hours, spread out over several days. At first I wasn’t going to ply it, but I figured I might as well learn some type of plying. I ended up going with a Navajo ply because you only need a single bobbin of yarn to do that plying method. If you aren’t familiar with spinning or Navajo ply, you start by making a loop, reach through the loop and grab the strand of yarn and pull it through. Over and over and over again. It is like you are hand-crocheting the single, all while pedaling the wheel to get the twist into the ply. It only took about an hour for me to ply the yarn. After plying, you soak the yarn. 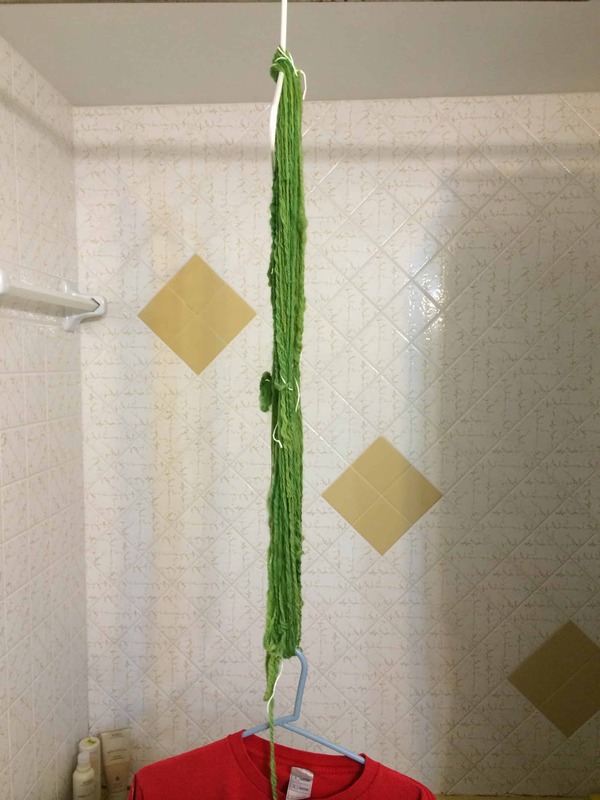 I filled one side of the kitchen sink with water and let the yarn soak for about two hours. Then I blotted it out and hung it in the bathroom to dry. 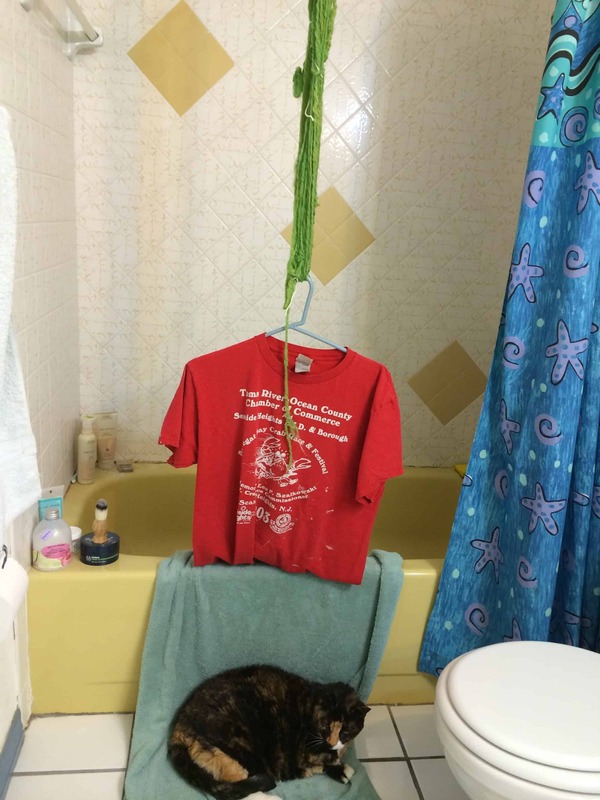 I put a t-shirt on a hanger and used that to weight the yarn as it dried. Here’s another close up. 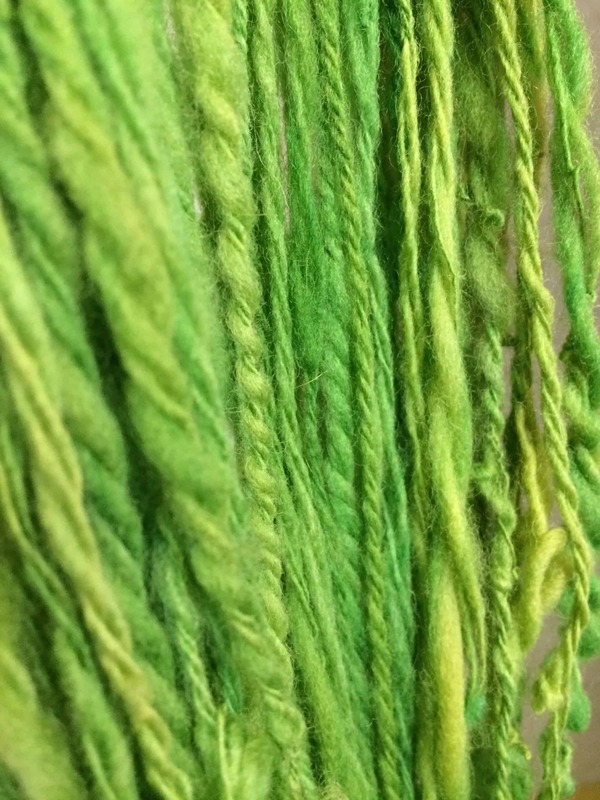 I took this one while the yarn was hanging and I think you can see the individual strands better. She was there every step of the way. 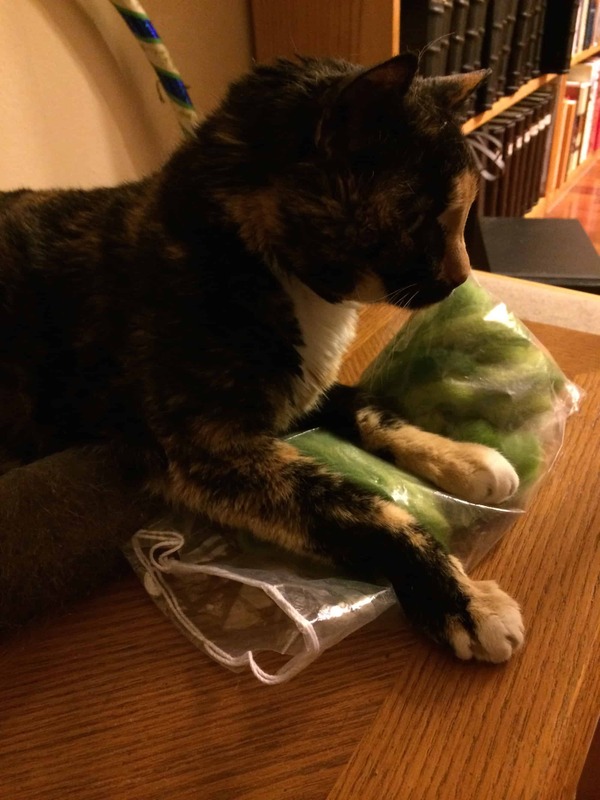 Maybe she feels a wee bit like the mama of this yarn too! with the exact same comment. There has to be a way you are able to remove me from that service? I am not able to remove you from that service, but you are able to do so yourself. The subscription / notification functionality is handled by WordPress, and as far as I can tell, I can’t even see a list of who is subscribed to my blog or comments. When you write a comment and click the notification check box, you then get an e-mail confirming that you want to subscribe. You have to click on the subscription link in that e-mail before the notifications start. Each notification e-mail you receive has an unsubscribe link in it. You can also sign in to your WordPress account and edit your subscriptions from there. I use WordPress for my blog. The theme is a free WordPress theme called Preference Lite. Previous Previous post: My Wheel Arrived! !